One of the best aspects of earning your MBA degree is that the education you get is absolutely top-to-bottom complete when it comes to business skills. You get the nuts and bolts of basic accounting, marketing, operations, and law and regulation. At the same time, you get a high-level perspective on markets and marketing, strategic planning, financing and funding matters. What this means is that after you graduate you’re as well-equipped as anyone in the country to start up and build a new business from scratch. If that’s your dream, then it’s well worth considering an MBA program with a specialty concentration in entrepreneurship. In addition to all the fundamental business building block courses, a concentration adds the extra magic that you need to innovate and navigate as a small start-up fish cruising in the turbulent waters with the big sharks of established businesses. It’s a set of skills that some of those sharks find valuable as well. The challenge for big business is to retain the spark and agility that comes with the start-up mindset to remain flexible and relevant in ever-changing markets. This means that even if you aren’t going to be an entrepreneur, an entrepreneurship concentration can pay dividends. But first you have to find the right program. Accreditation is a good place to start your search. A general accreditation in higher education from one of the six regional accreditation agencies in the United States is a must for every serious university. On a program by program basis, these accreditors look at things like faculty selection and standards, curriculum development, grading practices and even administrative and grievance procedures. Each of those elements of the program is weighed against the standards and practices of the international business community. The execs and managers that serve as association members provide an up-to-date, real-world perspective on the business training and research that companies want and need. Picking a specialty accredited program is vital to ensure that the education you are getting for your MBA matches the needs of employers and the market. So specialty business accreditation was where we started, but we didn’t stop there. Instead, we took a deep dive into those programs to find the very best options available in the U.S. today… schools that offer something a little bit above and beyond the usual. And we came up with some great finds! First, we picked only programs that have at least some online component. You’re busy, you’re on the move, you need an MBA program that can give you the flexibility to move on your own path while getting the information and education you need. Online courses let you shift your classwork around to fit into the demands of life and business in a way that any entrepreneur will appreciate. If a program isn’t flexible enough to fit your work schedule, it simply isn’t going to work. Next, we validated the core business curriculum at the school. A great set of classes on innovation and funding are nice, but they’re wasted if you don’t get the right skills that anchor every business: accounting, financing, HR, and strategic planning skills are important in organizations of every size. And since you’re building something from the ground up, you have to have a strong command of all of it on day one. There isn’t going to be anyone else to pick up the slack. Then, we looked at support systems available to students. Although it’s true that you’re on your own at your startup, it’s also true that entrepreneurs exist and thrive in a big, interlocking web of community support. Whether it’s through on campus startup clubs or university-funded incubators, we tried to pick programs that help you develop your network and build connections before you ever file your first set of incorporation papers. Finally, we kept our eyes open for the stuff that is truly unique and special. A school that offers an entrepreneurship concentration while still allowing you to study in another specialty track, for instance (after all, entrepreneurship isn’t a field!). Or schools that focus on innovation as much as entrepreneurship, giving you the skills and perspectives to take an entrepreneurial mindset into an existing corporation. If a program had a focus on a particular strain of entrepreneurship, for a minority population, perhaps, then we picked it out of the pile. Anything that offers extra value, a feature to stand out from the pack, upped the chances of making the list. Keeping an eye to the future is exactly what you’ll have to do as an entrepreneur, so you want to learn how from a program that has got that figured out. You’ll definitely find the right choice somewhere in this list. Entrepreneurship is a skill that can be used in just about any field, but there has been an increasing emphasis in recent years on using those startup skills to not just do well, but also to do good. With an MBA with Social Entrepreneurship Emphasis from SAU, you get a head start on implementing that philosophy of pursing socially responsible goals using the solution-building, efficient skills that come from the business world. To build that skillset, SAU puts you through intensive courses in creativity and innovation, laying down the startup mindset on top of critical core accounting and economic knowledge. Because many social entrepreneurship startups are international in nature, you get an extra helping of international business and sustainable supply chain practices as well. Community organizing, developing, fundraising, and activism are other standout skills that you won’t find in any other entrepreneurship MBA program. Biola’s hybrid MBA program doesn’t have to offer a specific concentration in entrepreneurship: the sole focus of the entire program is on entrepreneurship and the entrepreneurial approach to business. With tight biblical integration that builds scripture into modern teachings on ethics, theology, and other core business principles, you will learn how to do well by doing good. A strong emphasis on relationships means that you will start your career off with plenty of advice and assistance from other like-minded entrepreneurs. Strayer has been a school that has been all about business since it’s inception in 1892. But a long tradition hasn’t hampered the willingness of faculty and administrators to adapt to cutting-edge trends and topics in business. The digital entrepreneurship MBA focus is a shining example of that modern approach. There is no better choice in the nation for students thinking about creating new high-tech startups. With a solid business core in accounting, economics, and financing as a strong base, the program branches out into high growth digital startup management, technology and product management, and the place where the Cheddar partnership really comes in handy: digital media business operations. With first-hand experience in the still-evolving digital media space, you can graduate from Strayer with more insights and advantages in media startup operations than some people have after years in the industry. Whether you’re interested in taking advantage of the newest business innovations or you’re an emerging leader with an interest in developing a startup or existing business, Lynn University’s fully online MBA in Entrepreneurial Management is designed for you! In addition to a comprehensive MBA core, you’ll focus your MBA on financing entrepreneurial ventures, creating business plans, and introducing ideas into the marketplace through exciting, hands-on experiences that include in-class case studies, role plays, internships, and entrepreneurial contests! From launching innovative ideas into the marketplace to identify new business opportunities to exploring the culture of innovation in startups, the MBA in Entrepreneurial Management is where business professionals with a global mindset begin! Why should you study at Lynn? In addition to a truly innovative curriculum, you’ll benefit from Lynn’s iPad program, one of the most extensive programs of its kind in the nation. As a student here, you’ll receive an iPad upon admission and immediately begin to take advantage of the wealth of online resources available to you. The University of Georgia MBA experience is like no other. While almost all programs talk about ethics, leadership, and service, Georgia’s Terry College of Business puts those qualities into the program in ways that are inescapable—required volunteer hours within the community will teach you the value of giving back, while club membership will pull you together tightly with fellow students and business leaders. In a field like entrepreneurship, this is particularly important. Your coursework won’t vary greatly from any core MBA curriculum, but your ability to appreciate the creative drive behind any successful business will come from more than the sum of your studies. The UG MBA program will build those into your professional persona in a way that will never fade. 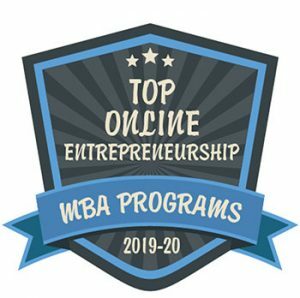 A fully online, focused program involving industry-oriented case studies and hands-on projects are the foundation of the rigorous and relevant curriculum of National Louis University’s MBA in Entrepreneurship. Pursue this program and you’ll not only receive a well-rounded course of study in effective communication, teamwork, ethical responsibility, and problem-solving, you’ll also gain a valuable foundation of knowledge in entrepreneurship, including the principles of authentic leadership and achieving a positive organizational impact. You’ll conclude your program with a comprehensive capstone—an opportunity to work with your peers to run a virtual company. You’ll also have full access to the Career Bridge, National Louis’s outstanding career services center that’ll help you do everything from prepare for an interview to craft the perfect resume. There are a lot of business schools that offer entrepreneurship concentrations in their MBA programs today. But the reality is that starting new businesses in different fields can face wildly different challenges and may require different skills in order to succeed. Technology is one of the hottest fields for startups today, with billions of dollars in venture capital floating around and new ideas flaring up and burning out on what seems like a weekly basis. So it only makes sense that if you plan to join or create a new high tech startup, you had best find an MBA program that will laser in on the special challenges you will face. K-State has you covered there with their technology entrepreneurship concentration. You will gain valuable exposure to the innovation and technology commercialization process. A dedicated tech internship program ensures that you will get a window into current high tech startups to learn the newest trends and techniques in an industry that can change overnight. On-site class options in Baltimore and Washington D.C.
Fifty percent female enrollment in the Carey Business School offers balanced and diverse student cohorts. Johns Hopkins prides itself on teaching business topics with humanity in mind. As a premiere global university in fields ranging from healthcare to international relations, that human touch is an important one. You won’t feel lost in the crowd at the Carey School, where every student has full access to the Student Success Center and Career Development Office as well as the highly qualified faculty. All of them share the goal of helping students realize their full potential and to find fulfilling careers… support that is vital in any entrepreneurship program. You’ll be taught how to walk the high-wire between building market share and managing burn rate, while juggling the realities of modern human resources requirements and the thorny problems of raising capital. Along the way, you’ll make important contacts with other students and current business leaders that will help you launch your next ground-breaking company. SVSU’s entrepreneurship concentration takes you from inception to marketplace when it comes to building a new business. The program is competitive, with students required to submit a business plan for evaluation during their course of study. None of the bases are neglected when it comes to business concepts and operations; the MBA program overall gives you a comprehensive view of business entities and the tools it takes to analyze and manage them. Critical thinking and creativity are the watchwords of this program, which is great news from the entrepreneurial perspective—learning to think on your feet and come up with unorthodox solutions is where the startup game is won or lost. Get ready to win with an MBA from SVSU. Walden actually offers two entrepreneurial specialization options to their master of business administration degree, which made it a tough choice over which to pick for the list. Both are great options that are above average, but in the end, the social entrepreneurship and innovation option won out over the small business concentration. Part of this is because of the dual-nature of the innovation focus… big businesses are also learning the value of operating with a startup mindset, and the innovation track gives you a set of skills you can use in the enterprise or on the ground in your own startup. But it’s the social aspect that really sold the program. This is a natural fit with Walden’s existing MBA emphasis on fostering an ability to work with others in diverse and complex business environments. Reasoning and ethical standards are also held in high regard in the core MBA program, something that the concentration builds on with additional coursework in critical thinking and change management. You’ll have open options in the non-profit or government world with courses available in grant writing, global perspectives on society and economics, and collaborative management systems. Thirty-six credits and 20 months of study are all you need to earn your MBA in Innovation and Entrepreneurial Leadership through Felician University. This rigorous and comprehensive course of study features a solid MBA core that’s complemented with in-depth study in areas like corporate entrepreneurship and creativity, entrepreneurial leadership and strategy, economic reasoning, and more. You’ll round out your MBA with a capstone experience and portfolio that focuses on the challenges involved in the management of growth. Plus, as a student of Felician, you’ll have ample opportunities to learn from experts in business through the school’s annual business symposium. Want to add an international component to your MBA? Consider participating in Felician’s one-week study abroad program in Dublin, Ireland. Team-based teaching from world-renowned faculty members. With an MBA in Entrepreneurship from UNC-Chapel Hill, you’re not just getting a piece of paper, or even a specialized set of business skills and knowledge for professional advancement: you’re getting a major course correction to your whole life. With a holistic educational approach that looks to build on your individual strengths, you’ll gain confidence and reasoning skills that will serve you in every aspect of your life. With a team-based learning approach in programs like ‘Student Teams Achieving Results’, ‘Global Business Projects’, and ‘Doing Business In’, you’ll forge valuable connections with fellow students that will last a lifetime. And like you, those students will be the cream of the crop—the program has high costs and high standards, and only the best can attend. And being the best is exactly what it takes to bring an idea from inception to IPO. You’ll get a first-rate general business education with the online MBA core curriculum, and then an extra layer of strategy, communication, and problem-solving skills through the entrepreneurship concentration. Although the concentration is in innovation and entrepreneurship, you’re really almost getting two for one with this diverse program—you’ll learn new cultures and new business environments from classmates that come from around the world, giving the Global Executive MBA as much of an international business education as one in entrepreneurship! It’s not cheap, but it is Duke. You’ll leave with an MBA that will earn instant respect in any corporation worldwide and a network that will help you succeed regardless of the field you choose. There’s no better way to prepare for an entrepreneurial career path than to make the contacts you will need to get off the ground while receiving the education and skills to evaluate opportunities and develop innovative business concepts. If you’re studying entrepreneurship in this day and age, then chances are you are going to be studying technology entrepreneurship. IT is not only the cutting edge of new business opportunities, but it is also driving the business cycle even in traditional industries. So if you’re not enrolled in a program like NC State’s TEC concentration, you are already behind the curve. But if you are smart enough to get into TEC, you get the low-down on all the important aspects of creating a business in the modern world: intellectual property issues, venture capital and equity considerations, the evaluations of technological products. Even more importantly, you get the secret to step 3 on the traditional 4-step path to profits: commercializing the product. If technology isn’t your bag, there’s also a more traditional ENTR (entrepreneur) track to the concentration, but why spin your wheels? Recognizing that entrepreneurial skills—the financing, marketing, and managerial talent it takes to get a business off the ground—is only half the equation is what makes the Cedarville MBA specialization in innovation and entrepreneurship outstanding. You get all those skills, of course, together with the traditional MBA education in accounting, information technology, and strategic management, but on top of those you get a master course in innovation, taught by some of the best in the business: a partnership with the International Center for Creativity puts you on the front lines of design innovation, creativity, and sustainable business modeling. You’ll receive focused expertise in business modeling and new venture creation, emerging trends, and design thinking that will help hone your own creative skills to build a business that is actually worth getting off the ground. As a school that conducts most of its graduate education entirely online, you know that you are getting both practiced and expert remote instruction through Messiah’s programs. Instructors have the experience and expertise to ensure that you get the most out of online classes, while maintaining the flexibility to take them when and where it’s most convenient for you. You’ll get the direct mentorship and support you need to make the most of the unique curriculum in social entrepreneurship. While there are hundreds of entrepreneurship concentrations available at MBA programs around the nation, Messiah’s is one that is uniquely aligned with the overarching goals of this Christian school: fostering business participation in producing quality goods and services that help solve societal challenges. By encouraging students to consider startup efforts in social spaces, the entrepreneurship concentration offers the tools and techniques required to create a scalable business that isn’t just economically successful, but also creates genuine social value. When you see an MBA program that is ranked number 1 and 2 by two independent, highly respected rating sites, then you know going in that you are going to be looking at something unusual. In CMU’s case, that’s a groundbreaking curriculum structure that doesn’t bow to the old-fashioned model of squeezing every topic into a 3-credit, 1 semester class. Using mini-semesters and unique program structuring, CMU fits in every topic to exactly the right amount of time to teach it. Moreover, courses are scheduled to build on one another so you aren’t just getting random doses of data from class to class. The entrepreneurship concentration was one of the first in the country and is anchored in the Swartz Center for Entrepreneurship, which partners MBAs on business plans, venture capital, and startup market entry. If you take the option Entrepreneurship Track, you will also get a capstone focused on the essential elements of starting and running a business. Clarion’s base MBA program is all about providing a solid basis in the business knowledge that every executive should be equipped with. Accounting, finance, and leadership are all part of the core curriculum module you will be required to complete. But the innovation and entrepreneurship builds on all those basics and offers a lot more. You will learn how businesses can transform and create breakthroughs that can change the entire nature of a market. You’ll learn successful strategies for capitalizing and growing new businesses, as well as planning to cope with limited resources and create exit strategies. Lehigh’s Corporate Entrepreneurship concentration in their highly respected MBA degree program offers a detailed dissection of the conception and creation of new corporate ventures. The concentration delivers a flexible but in-depth inspection of the risk and reward of startups. You’ll get exposure to information on business modeling, organization, market analysis, and financial forecasting that you’ll need to weigh the risks and rewards of entrepreneurial ventures. Instructors will talk you through the aspects of raising venture capital that you need to consider before turning over ownership stakes in your new baby. With a more solid core of concentration-centric courses than most specialty tracks, the concentration tacks on even more benefits with an array of electives that can take you deeper into entrepreneurial topics such as valuation, production infrastructure, and developing credit facilities that most other MBAs won’t even touch. Home to the esteemed Wukich Center for Entrepreneurial Opportunities, which was created to provide assistance to existing businesses in the community and region, Seton Hill University is committed to supporting entrepreneurs, so it’s no surprise that their MBA in Entrepreneurship is both rigorous and comprehensive. Upon acceptance into the program, you’ll immediately meet one-on-one with the Program Director, who will work with you to develop a learning plan that best meets your career goals. Throughout the program, the Program Director will also serve as your personal academic advisor, as will a dedicated faculty of Seton Hill career services professionals. As a student of the MBA in Entrepreneurship, you’ll complement classroom learning by analyzing high-profile business cases and scenarios of publicly traded companies and more. Throughout this comprehensive, fully online program, you’ll be supported by an esteemed faculty of experienced business professionals. Salve Regina University is where emerging business leaders like you turn for the best in graduate preparation for careers in today’s evolving business environment. Choose the MBA in Entrepreneurial Enterprise and you’ll dive deep into the intricacies of business plan development, strategic planning, and creative problem solving alongside a solid and rigorous MBA core. This 36-credit fully online course of study features everything you’d expect from an on-campus degree, including a dedicated and qualified faculty who serve not just as instructors but as mentors, providing you with career and networking advice and guiding you as you explore everything from business plan development to strategic planning. And the support doesn’t end there. As an online student, you’ll have access to the Center for Student Development, your connection to the best in student assistance and engagement. Rice has taken the training wheels off their online MBA@Rice program and put together an online MBA program that is as good or better than their full-time, on-campus offering. With mobile support, periodic Residential Intensive Learning Experiences to bring you together with your cohort in the real-world, and all the same international field experience, you don’t have to worry about diminishing returns with this hybrid degree program. With the entrepreneurship concentration, you’ll learn an essential framework for establishing, growing, and modeling a new business. That’s in line with just about any other entrepreneurship concentration in the country. But where Rice goes big is their multi-concentration option… you have the opportunity not only to learn the essential elements of business startups, but also the ability to dive into a particular market in which to kickstart that new business. A healthcare company? Energy services? Strategic management consulting? All those options and more are on the table in this one MBA program, making it a great first stop for entrepreneurs. The Acton MBA in Entrepreneurship is based around Harvard-style case discussions and a cohort approach to business education. The experience is unique, with a dedicated campus in Austin devoted to the program. It’s highly tailored to students who are serious and motivated about opening their own business, as some 63 percent of graduates eventually do. You had better show up on day one prepared to hit the ground running, because instructors push hard and expect you to rise to their high standards. You’ll go at a break-neck pace covering hard-edged courses on every phase and aspect of the startup cycle, from the inception of opportunities to funding to launch to growth and valuation. Yet the program also has a softer side, one that explores inspiration and helps students find the calling that matches their skills and talents. It’s a serious program for the seriously motivated, and you’ll graduate with all the tools you need to meet your entrepreneurial dreams. UV’s Darden school has ten great functional or theme concentrations and seven diverse industry specialty areas available for you. Out of all those, we picked the Entrepreneurship concentration as the best. Why? Because Darden practically oozes innovation out of its pores as a business school. Even in the general MBA program, faculty approach lesson with an entrepreneurial mindset, preaching innovation and problem-solving. The school hosts the i.lab Incubator to provide student start-ups with up to $10,000 in funding as well as professional and professorial support. The new IDEA course, teaching Innovation, Design, and Entrepreneurship in Action, gives students experience working on consequential real-world projects sponsored by corporations, non-profits, and government agencies to learn design thinking, agile project management, and other practical entrepreneurial skills. We could go on, but in short, if you get to the other side of a UV-Darden MBA without launching a business along the way, the problem is you, not them! Jesuit universities are often known more for their rigorous academic standards than for their innovation. Gonzaga manages to upset that stereotype in two different directions at once with its unique MBA in American Indian Entrepreneurship. Not only does the program focus on training students in the delicate art of creating strong and innovative new businesses, it does so with one of the most unexpected market sectors: American Indian reservations. Students learn all the common theory and techniques in advanced business skills such as economic and accounting analysis, but with a focus on the unique culture and history of Indian Country. Courses on understanding tribal leadership and tribal strategic management drive home the unique challenges and opportunities available to entrepreneurs creating startups on the rez. At the same time, forward looking courses in information systems and operations equip you to build the kind of company that will thrive in any region of the world. In less than two years, you’ll go from student to MBA grad through Concordia University – Wisconsin’s MBA in Innovation and Entrepreneurship. Offered fully online for working professionals like you, this program features a solid MBA core…manageable, eight-week courses…a faculty of industry experts…and even opportunities to study abroad in places like China or Austria. Plus, you’ll study with a diverse group of like-minded peers while you dive deep in areas like strategic innovation, sustainability, and creative problem-solving. You’ll also enjoy the best support and guidance as an online student, thanks to the Information Technology Office and Career Services.